Here’s the thing about The Farrelly Brother’s ‘Three Stooges’ movie, which I believe catches the essence of the ‘Three Stooges’ just about perfectly, is that it is so infantile, and so inane, and so banal that I often caught myself sitting in the theater, reminding myself… it’s a ‘Three Stooges’ movie… what do you expect… it’s a ‘Three Stooges’ movie. If you say that to yourself enough, and if you remember actually liking the Stooges as a child, as I did, then you should be okay with this one. If you forget this, or you never cared for the stooges, then make sure watch this with no sharp objects or random rope nearby, because you won’t make it. But then… why would anybody who didn’t care for the Stooges even bother to watch a Three Stooges movie? Before Moe (Chris Diamantopoulos), Larry (Sean Hayes) and Curly (Will Sasso) became the adult nitwits that we all came to know and love, they started out life as adolescents, looking like something out of Our Gang, at the orphanage where they were child dimwits causing a ruckus and making life hell for the poor sisters at the orphanage. Especially the Hebrew-esque sister Mary-Mengele (Larry David) who is subjected to all kinds of blunt force objects accidentally falling on her dome. Moe had a chance to actually get adopted, but he found it difficult to leave Larry and Curly behind, the honor instead going to the super cute little Teddy. Now in a page ripped out of the Blues Brothers, the adult Stooges have gotten word that the Orphanage is on the verge of closing down, unless somehow the sisters can scrape up 800 large in the course of a month. Sure Larry, Moe and Curly have no idea how the real world works since they’ve never been off of the orphanage, but they have gumption and heart and they are nitwits which should offer some kind of buffer for the cruel world outside as they begin their adventure to save the orphanage. How does one go about making 800 thousand dollars in thirty days with no formal education, on top of being special needs adults? I was going to say a semi-functional retard, but that’s a bad word nowadays. The short answer is ‘it can’t be done’, but the Stooges have gotten lucky in that Lydia the Black Widow (Sofia Vergara) who with her scurrilous lover Mac (Craig Bierko) need her rich husband killed, and a trio of easily manipulated halfwits would be nice about now. Oh would you look, a trio of easily manipulated halfwits has just shown up. From this point the movie pretty much descends into an endless spiral of pure stoogesque nonsense, with more hijinks and wackiness and zaniness and eye gouging than you can shake a stupid stick at. Toss in some J-Wow and The Situation and The Old Spice Dude… who was great in this by the way… and you have a movie that couldn’t get any dumber if it tried. But yet it somehow does. It’s something to see. I’m thinking… could anybody go to a modern ‘Three Stooges’ movie and expect anything more that this? 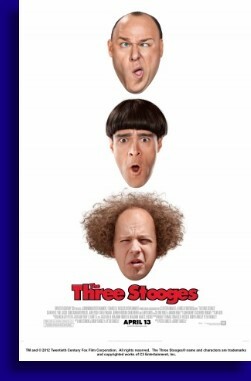 Now I know some critical types have laid into this movie with both barrels blasting but this is ‘The Three Stooges’ and as I recall the Stooges and their comedy was a different kind of funny, meaning that it was comedy based on physical stupidity and abuse as opposed to witty jokes and clever humor. If I recall correctly. About that hazy recollection, this is why as a six-year old coming home from school I loved the Stooges. Couldn’t comfortably eat my Ho ho’s or drink my instant milk without watching the Stooges. You did not need to be intellectually sophisticated to recognize that somebody getting poked in the eye, hit in the head with a hammer or kicked in the gonads was some damned funny stuff. But sadly… I soon turned seven and that stuff became less funny. Intellectually as a second grader I had outgrown the Stooges, and I don’t believe I’d seen a Stooges short since then until I saw this movie. Now while not nearly as sharp as I was as a seven year old, but I’m still probably a little too old to truly appreciate all this movie had to offer comedically speaking, but Diamantoupolos, Hayes, and Sasso were definitely on point as Moe, Larry and Curly. Sean Hayes in particular was killing me. The Farrelly’s made no compromise when bringing the unique brand of humor that the Stooges brought to the screen, and we appreciate that. Can you imagine if someone tried to intellectualize the Stooges? How horrible would that have been? The bottom line is that movie is funny. It’s a Stooges movie and even by accident, even if you hate the Stooges, somewhere during this running time you should laugh at least a couple of times. I mean if you pay ten dollars for a movie ticket and you get two laughs then that’s certainly not good value, but then if you pay ten dollars to see a Stooges movie and you hate the Stooges… well… I’m just saying that’s something a Stooge would do. Know what I’m saying?